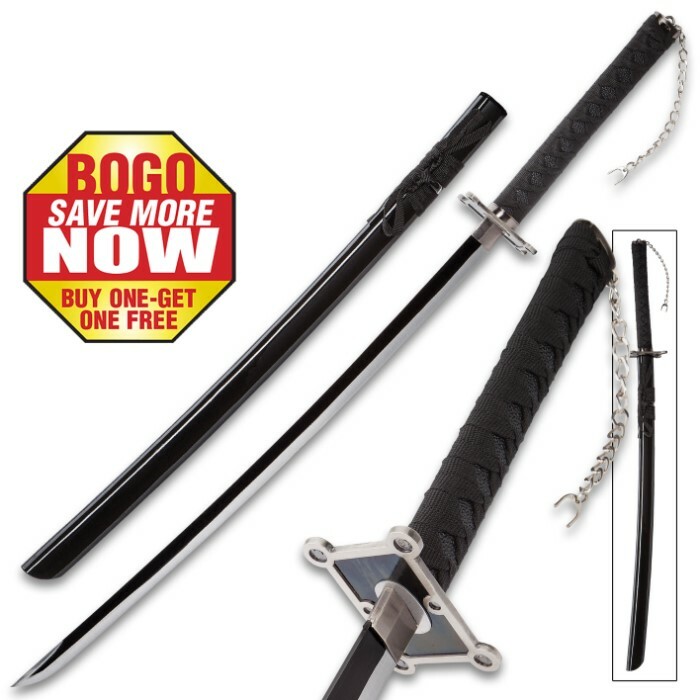 Get two awesome samurai swords today! You won't find a more stylish or better quality sword at this price point than this Black Warrior Samurai Sword, complete with a 27 1/2" two-tone, false-edged stainless steel blade. The sword features a custom cast metal tsuba with a geometric design and a faux ray skin and black cord wrapped handle, which has a chain accent for that authentic detail we know you appreciate. The blade is sheathed in a black lacquered scabbard with black cord accent wrap. Buy one for a friend and keep one for yourself with this awesome BOGO deal! The Black Warrior Samurai Sword is good for a display sword. When you read"false edge"and "excellent display sword",don't expect something else and you won't be disappointed. No where does it say the blades are DULL, not sharpened , kind of misleading. Quality is low too, but they are ok for $15 swords, i guess.